First-time home buyers may be eligible for a 15 per-cent income tax credit for closing costs. 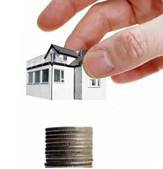 To assist first-time home buyers with the costs related to the purchase of a home. The First-Time Home Buyers’ Credit (FTHBC) provides a 15 percent credit on a maximum of $5,000 of home purchase costs (e.g. legal fees, land transfer taxes, etc. ), meaning maximum tax relief of $750. Applicable to first-time buyers purchasing a home closing after January 27, 2009. The FTHBC is claimable for the taxation year in which the home is acquired. An individual will be considered a first-time home buyer if neither the individual nor the individual’s spouse or common-law partner owned and lived in another home in the calendar year of the home purchase or in any of the four preceding calendar years. For more information contact Service Canada at 1-800-662-6232 or visit www.fin.gc.ca.